Saint John of Las Vegas Movie Getting lucky is a roll of the dice. 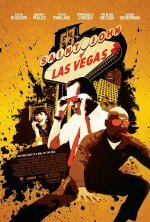 Saint John of Las Vegas release date was Friday, January 29, 2010. This was a New York / Los Angeles release. After a run of bad luck, John, a compulsive gambler, runs away from Las Vegas and toward a normal job and life. Taking a nondescript position in an auto insurance company in Albuquerque, he tries to get ahead in the straight world, amid the ever-present temptations of scratch-off lotto tickets. When his boss, Mr. Townsend, asks John to accompany his top fraud debunker, Virgil on an investigation of a dubious car "accident" near Vegas, John sees an opportunity to get a promotion, although he's concerned about returning to the gambling game. Before leaving he becomes involved with his eccentric co-worker Jill, a dalliance that has the potential to become a real relationship. Soon John is on the road with Virgil. While Virgil is the supposed leader of the investigation, it's John who begins to finally assert himself, pushing the case closer to a conclusion. Through the journey, John's confidence builds, and he realizes that he can't escape his gambling addiction by running away from it -- it will follow him wherever he goes. It's only when he returns to Vegas that his experiences there finally send him on the path to breaking free.